We were blessed to get TV stations from 2 cities...Monroe & Shreveport. If the weather was bad & messing with the reception in one direction, we just went outside & turned the antenna in the other direction. The only exception was ABC. Monroe had no ABC affiliate until the mid 90s (I think). And of course if the president addressed the nation, your only escape was PBS. IIRC there is a Nevada county which is part of the market... of Denver! What? Which one? I thought that all would be in Las Vegas or SLC markets if out of state. I'm pretty sure either Eureka or Lander county (maybe both) have been in the Denver market before. I know the Denver market extended into South Dakota at some point. Now I check, Wikipedia now lists Eureka county as part of Reno media market, it used to list it as part of Denver's! Back when I proposed redrawing US State lines to match something else, I considered using media markets to do so, but I dismissed it because it would result in several states with less than 100,000 inhabitantes, the smallest one with just 14,000! (Which would be the Glendive MT "state") In the end I used NWS Weather Forecast Offices to do that. It goes back to even before the days of sat TV. Denver stations existed first and were microwaved into many other places. Later in the BUD (big ugly dish) era, among the options to get network stations was a package called "Netlink Denver 5" which was the Denver local stations. - Parkersburg. Historically just one station (NBC), everyone get provider TV and the H-C or Columbus stations anyway. 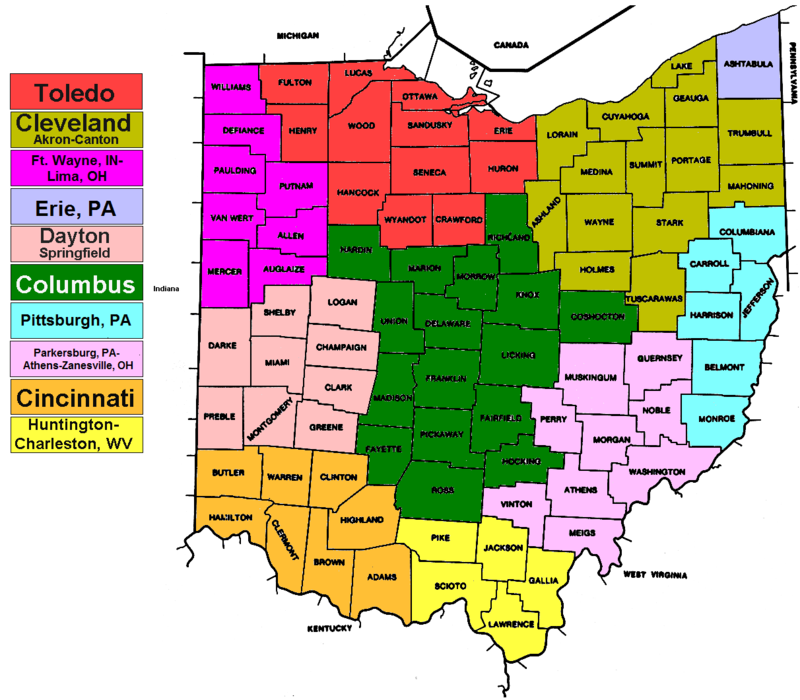 Shut it down and make H-C (the 2 WV counties) and Columbus (the one OH one) a little bigger. - Bluefield-Beckley-Oak Hill. Historically just two stations (NBC and ABC) which were so far apart no place could get both OTA. CBS, and later Fox, was brought in by cable from H-C, Roanoke, or even Bristol. (Now has a CBS with .2 Fox at a yet third independent location). Population bleed has reduced what was always a small market to near nothing. News coverage is pure amateur hour. Kids just out of school and sales guy with no talent, using 30 year old SD equipment. Shut it down and make H-C larger. - Wheeling. Historically just 2 stations (NBC and CBS) with ABC from Pittsburgh. Just a few miles from Pittsburgh, the area got its own TV stations when the Rust Belt was not yet rusting. Population bleed means no money for anything. News operations are worse than Bluefield's. Serves no purpose. Shut it down and get Pittsburgh stations, which everybody does anyway. - Clarksburg. Also always missing ABC, which comes from Pittsburgh, along with all the other Pittsburgh stations. Worse market in the state. No money for anything. In fact so amateurish that several counties have been "captured" by Nielsen's methods by Pittsburgh. Shut it down and let Pittsburgh and H-C get larger. In doing so the result is the two panhandles and the northern edge of the state served by the cities that are part of (DC or Pittsburgh) and the rest of the state being one market (similar to New Mexico or Utah) which would be 12 places larger in the list of markets, with the economy to support a serious effort at news and other local programming. The Coachella Valley CA has channel 50 - subchannels .2 is WPMY (My Net) Pittsburgh (serves West Virginia), .3 WPMI (NBC) Mobile, AL (Gulf coast including Miss. & Fla.), .4 KDMD (CBS) Alaska (not sure it's from Anchorage or Juneau) and .5 KEZI (ABC) Eugene OR (Pacific time schedule). The seasonal resident population forms a large portion of the TV market demographic, as well these areas are known for large low-income migrant worker populations come to the resort economy in the winter season. Appalachia, the "Delta" or "cotton belt", Alaska and "Pooregon" - that makes sense. However, the majority of resort work is from Mexico and Central America like Guatemala and El Salvador, as well Puerto Rico (an US territory) and even the Philippines - they immigrate to Guam, Saipan and esp Hawaii. KVMD channels 23 and 31 (based in 29 Palms and Victorville) have 2 Tagalog or Filipino languages subchannels - the Philippines also have Cebuano, Ilocano, Mindanao and Visayano. Channel 50 itself (29 in 29 Palms) is our local My Net. station, KPSE owned by KMIR (NBC), and KMIR is now on cable in 29 Palms, because they used to not be over-air there. Move Detroit’s transmitters in Southfield further east to cover Port Huron (as mentioned by 7/8 above, it does not currently have coverage). There are some areas around Warren that might work. This means that signals are weaker in western Livingston and Washtenaw counties, but they are close enough to Lansing to receive over-the-air signals, even if they are still part of Detroit’s DMA. I'd move Monroe County to the Toledo DMA. 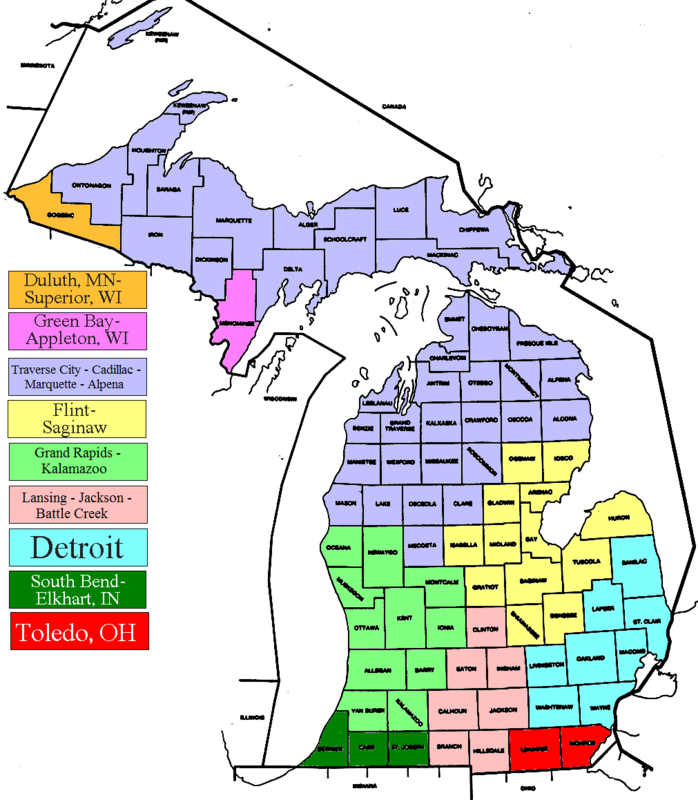 For the Grand Rapids DMA, I’d move Calhoun and Branch Counties to the Lansing DMA. Battle Creek is currently part of the Grand Rapids DMA, but it’s closer to Lansing so I think it belongs there. While we’re at it, give St. Joseph county to South Bend’s DMA, which is much closer to that city than to Grand Rapids. I’d move all of the Grand Rapids DMA transmitters to Jamestown, MI (midway between Muskegon and Kalamazoo, and within 15 mi of Grand Rapids). This basically trades coverage of Battle Creek for coverage of Muskegon, which currently only receives WZZM 13 over the air. By making the Grand Rapids DMA smaller, you only need one ABC affiliate (as mentioned by ftballfan above, there are two). I don’t have any major changes to the Lansing and Flint/Tri-Cities DMAs or their transmitters. Lastly, I’d combine the Traverse City/Cadillac, Marquette, and Alpena markets. The Alpena market is the third smallest in the nation, and I don’t know why it has its own market. The UP and all of northern lower can share one medium-sized market. Put a set of full-power transmitters near Cadillac, with translators in Alpena, Marquette and the Soo. Eliminate the Lima, Youngstown, Wheeling (see SP Cook's post) and Zanesville markets. They’re too small to stand on their own. Merge Lima into Fort Wayne DMA (to ensure Lima has over-the-air coverage, move the transmitters for Fort Wayne to the state line near the town of Monroeville). Merge Youngstown into Cleveland (by moving Cleveland’s transmitters to Solon). Youngstown’s population has basically declined to the point where it’s just another suburb of Cleveland anyways. Lastly, merge Zanesville with the Parkersburg and Athens DMA. I’d move Toledo’s transmitters south of where they are now. At the moment, they’re located too close to the Michigan border, which is already covered by Detroit's stations. I’d say move the transmitters down to Bowling Green to cover the area south of Findlay. For Dayton, move the transmitters to the northwest of the city, away from Cincinnati. For Cincinnati, move the transmitters to Kentucky, away from Dayton. For Columbus, move the transmitters to Westerville (a northeastern suburb) so that the signals can reach Mansfield. Interestingly the major Ota tv stations owners as of 2017 are Sinclair, Nexstar, Grey, Raycom, Scripps, Hearst and Tegna. I don't think a new gerrymandering of the DMA maps are going to happen. I don't see any possible benefit that could be gained by gerrymandering TV media markets. There are 2 oddities that I find in the Northeast. The first is Windham County, VT being in the Boston DMA. It would seem more logical for it to be in the Springfield, MA market, seeing that Brattleboro is only 60 miles from Springfield and over 100 miles from Boston, plus it borders Franklin County, MA, which is part of that market. The other is Berkshire County, MA and Bennington County, VT being part of the Albany, NY market. They belong in the Springfield and Burlington, VT markets, respectively. Both are counties that are in a market that all but these 2 counties get NYC regional sports networks, while the rest of the Albany market cannot get Boston regional sports networks. Plus, most Berkshire County cable systems get Springfield stations anyway. Here, redrawing the lines may make sense. It's why counties should be split if possible (like the National Weather Service does for forecast areas). People in Berkshire Cty can live, on a line, 20 miles from downtown Springfield living near Hampden Cty or 25 miles from downtown Albany living near the NY border. The county should be split in half, diagonally, from southwest to northeast, with the obvious halves going where they belong. Windham Cty VT should clearly be somewhere different than Boston. I've always appreciated that Boston 25 has embraced it in weather reports and points out weather for Keene and Brattleboro. The others ignore everything that far out. I'm surprised that New Jersey don't have counties that are split by two TV and Radio markets in the central part of NJ though. Its given how Philadelphia and New York are essentially covering those areas though. You've got a point with Berkshire County. Blandford is 20 minutes from Springfield, and over an hour from Albany. OTOH, Williamstown is a straight shot on route 2 to the Capital District, but 80 miles from Springfield. It's like another couple of anomalies. You can get from Enfield, CT to Downtown Springfield in 7 minutes, but Enfield is part of the Hartford/New Haven DMA; WGGB's studios are about 15 miles from Enfield, but default ABC affiliate WTNH's are an hour away in New Haven. Suffield is 7 miles from WWLP's transmitter across the MA border in neighboring Feeding Hills, but WVIT is the default NBC affiliate, and their transmitter is 40 minutes away in West Hartford. And Hartford County needs to be divided by the NWS. I can never understand why they have to issue a Winter Storm Warning for the entire county when towns on the MA border like Granby or Hartland are forecast to get a foot of snow, while towns like New Britain and Southington 40 miles away in the same county get all rain. It's even crazier when Hartford County gets one and New Haven County doesn't; it could be all rain in Southington, but go up 600 feet to Wolcott in New Haven County, and it's snowing to beat the band. I always found it weird that Coos County, NH was in the Portland, ME media market. This is a county that definitely should be split since the western half of Coos would fit better in the Burlington, VT market. Windham County, VT and Cheshire County, NH are tricky since they're both actually closer to Boston than either Albany or Burlington. I don't know how to resolve that. Create a media market anchored in Concord, NH? Just thought of one more: Fishers Island, NY. It’s considered part of the NYC DMA and gets the full set of NYC affiliates and NYC sports networks, but it sits 2 miles off shore of Groton, CT (Hartford/New Haven DMA), and as the crow flies, it’s closest affiliates would be Providence; it’s only 6 miles from Westerly, RI. It’s closer to Gillette Stadium than MetLife, and about equidistant from Fenway, Yankee Stadium and Citi Field, but has no Boston sports viewing options. NY and CT should really just transfer ownership of Fishers Island to Connecticut. It's apart of CT in everyday but legally. The island was the subject of a border dispute between New York and Connecticut. The states of New York, Connecticut, and Rhode Island meet in the waters east of Fishers Island. Before the British took possession of New York City from the Dutch in 1664, all of Suffolk County was claimed by Connecticut, with British settlers there accepting its jurisdiction. A 1664 land patent given to the Duke of York included all islands in Long Island Sound, apparently thus granting Fishers Island also to the Province of New York. The Duke of York held a grudge against Connecticut, as the New Haven settlers had hidden three of the judges who sentenced his father King Charles I to death in 1649. Settlers throughout Suffolk County pressed to stay part of Connecticut, but Governor Sir Edmund Andros threatened to eliminate their rights to land if they did not yield, which they did by 1676. A joint commission from Connecticut and New York in 1879 reiterated that New York has legal title to Fishers Island. It's interesting because I always thought Suffolk County looked like New England with historical houses on the waterfront. Culturally though, I can't say since I unfortunately haven't been there. If you get out on the forks of Long Island, you’ll think you’re more in coastal New England. The architecture and atmosphere of Greenport is not much unlike that of Watch Hill, RI. or Old Saybrook, CT (it’s only about 15 miles across the sound from Old Saybrook). But get into Riverhead or especially a place like Patchouge, and the NYC cultural influence kicks back in. Splitting counties should have been done more often (by zip code or township boundaries) in MI. Only that it would be for cosmetic purposes, Worcester County, MA could also stand to be split up. It is for NWS purposes, and like Berkshire County, it stretches from border to border north to south. Perhaps a Quabbin County that could include the towns around Quabbin Reservoir, as well as the Fitchburg/Leominster area. KCRA 3 (NBC) Sacramento - the state capital has over-air transmitters across the northern half of CA, with one in Chico (the Redding market, yet Chico is almost the same size as Redding) and Ukiah in Mendocino county (closer to the San Francisco Bay area). KCRA 3's transmissions can reach Merced, 90 miles to the south (part of the Fresno market). Both Fresno and Chico-Redding have their own local NBC affiliates, so does KNTV 11 San Francisco-San Jose, which replaced KRON 4 in the 2000s. Nearby Salinas-Monterey market has KSBW 8 which co-owns KSBY 6 in San Luis Obispo-Santa Barbara market. And Tulare county near Delano can receive some Bakersfield market stations. SC is a smaller state, but we have multiple TV markets. Charleston and Columbia are the only two markets with only SC counties included. Florence/Myrtle Beach, Greenville/Spartanburg, and Charlotte all have NC counties included, while Savannah and Augusta have GA counties included. Florence/MB is a weird market. CBS (WBTW) has been there since the 50s, and is the heritage station in the market. Until the 80s, Myrtle Beach was treated as just another town. ABC (WPDE) was added in 1980. Prior to that, most people got ABC from Charleston, Wilmington or Raleigh. The entire market got a Fox affiliate in 1997 (WFXB). Prior to that, Myrtle Beach and Lumberton shared Wilmington’s Fox affiliate (WSFX). Florence had their own Fox low power station. NBC was not added until 2008. Prior to that, WIS Columbia, WECT Wilmington, and Charleston (either WCBD or WCIV) were available, depending on where you lived. Georgetown County, a big part of the Grand Strand, that goes within 15 miles of Myrtle Beach, is in the Charleston market. The CBS, WBTW, was dropped from local cable a few months ago, and only CBS from Charleston remains. ABC and NBC from Myrtle Beach are still available. That reminds me that we used to get WSBK-38 here as a part of our cable system up until the mid 90s. Do remember watching a few Red Sox games. Southern UT (St. George) has translators of Salt Lake City and Las Vegas NV market stations, as well some Phoenix AZ TV. They get CBS, FOX and My Network from north (Salt Lake), CW and NBC from west (Vegas), and over-air ABC from south (Phoenix). Since they are in UT, 3 PBS from Provo (Brigham Young University's KBYU), Ogden and Salt Lake city. I suppose they get ABC from Salt Lake and Las Vegas each, and CBS KPHO 5, co-owner of independent KTVK 3 (former ABC affiliate) from Phoenix. We got WSBK on my cable system in CT until 1995, right around the time that TV-38 went UPN and lost Red Sox rites and gave up the Bruins road games package to NESN. When my family first got cable, I got all Hartford affiliates, all Springfield affiliates (still get PBS from Springfield), all NYC affiliates, and WSBK (before cable was available on my street, WLVI was also available from Boston). When our system first expanded beyond 36 channels, we lost Springfield NBC and WABC, then little by little, lost other affiliates after the old company merged with Cox. We got NYC channels because my system is based in New Haven County, but Cox wanted to streamline it with its other 2 systems in Hartford County, so they were phased out. First Springfield ABC went away, followed by WSBK, then WCBS, WNYW, and WWOR (I had the local feed; it went away when the EMI feed, which the other 2 systems had, ended). We still had WNBC on 9/11, but lost it soon thereafter. WPIX was the last holdover, which we lost about 7 years ago. Having the NYC affiliates was nice because you'd often get an extra NFL game on Sunday when the NYC affiliate showed a different game than the Hartford affiliate. KSL 5 (NBC) was a former CBS affiliate for Utah, based in Salt Lake City, and it's owned by Bonneville Media, which is a subsidiary of Bonneville Int'l Corp - owned by the Church of Jesus Christ of Latter-day Saints in Mormon majority UT. It can be viewed throughout UT and 4 neighboring states on cable, satellite and over-air transmissions. It owns radio stations KSL 1160 AM and 102.7 FM. Here is one interesting fact though KOVR was originally going to be a Bay Area TV station. But due to affiliation deals but ABC wanted the station away from Bay Area territory though. After Channel 13 left Mount Diablo to Walnut Grove to get the ABC affiliation deal for Sacramento and Stockton. The Tulsa TV market's stations which extends beyond the KS state line (Coffeyville) and Tahlequah between Muskogee OK and Fort Smith AR. NBC on 2 (and 8 - subchannel?) but on channels 4 in Coffeyville KS, Independence KS and Tahlequah; CBS on 6 and 10 (transmitter? ); ABC on 8 (it had univision programming before it had its own affiliate on 25); the CW on 19 based in Muskogee (in 1999, Tulsa was the only metro area without a WB affiliate - WGN America 9 was its source for WB, now the CW), FOX on 23 (KOKI - substation of KOKH Oklahoma City); and My Net on 41 (KMYT, formerly KTFO - it means forty one or FO(X), had a radio station KCFO). PBS on 3 (Eufaula), 11 (Tulsa) and 13 (Oklahoma City), plus Rogers State College TV on 35 from Claremore. The TBN station on channel 17 from Bartlesville is on cable 7 or 10, and ION channels 33 and 44 from Muskogee on cable 3 or 4. KOCO 5 (ABC) OKC on cable 12 to some in Tulsa; by Kansas state line, they get NBC 3 from Wichita; by Missouri state line, FOX on 7 from Joplin; and by Arkansas state line, CBS/My Net 5 from Fort Smith-Fayetteville.